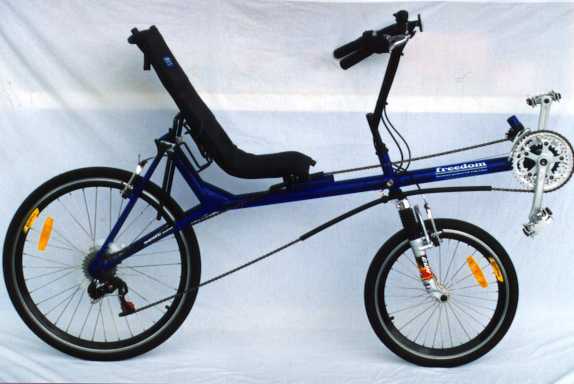 The "Tailwind" is a short wheelbase recumbent with above seat steering designed as a comfortable alternative to a sport racing bike. The relaxed seating position is adjustable for both leg length and recline angle. Frames come in two sizes to accommodate riders between 165cm and 205cm. SPECIFICATIONS: FRAME: Pulse TIG welded 4130 Cro-moly tubing. SEAT: Cro-moly tube, UV-resistant mesh cover, adjustable for leg length and recline angle. FORKS: Cro-moly (suspension option available). COLOUR: Safety yellow powdercoat frame and forks. HANDLE BARS: Aluminium with cro-moly steerer. FRONT HUB: Shimano STX-RC. REAR HUB: Shimano STX-RC. CASSETTE: Shimano 11-28 8sp. RIMS: Velocity deep V. SPOKES: DT stainless steel 14g. TYRES: Vredestein montecarlo skinwall slicks. GEAR SHIFTERS: Gripshift 24 speed. FRONT GEAR: Sachs Centera. REAR GEAR: Sachs Centera. CHAIN: Sachs SC-40. CRANK SET: Shimano Exage (110/74pcd). BRAKES: Shimano STX-RC V-brake. Alternative custom specifications or colours available on request. Accessories such as mudguards (fenders) or pannier racks are available. *The "Tailwind can be purchased as a frame kit by homebuilders. The kit contains: frame, fork, chain guide, handlebar and stem assembly, seat, seat cover and fittings, as well as extra long gear and brake cables (standard bicycle parts are required for completion).